Pretty much anyone who follows music knows of, or has at least heard of Van Morrison. You know–the guy who sang “Brown Eyed Girl”–yeah, that dude. Well, it just so happens that he is considered by many to be one of the best songwriters of the 20th century. And well deservedly. His lyrics, although overshadowed by Bob Dylan’s, have inspired dozens of musicians. Most famously, but not limited to, Bruce Springsteen, Bono, Bob Seger, and Elvis Costello (go look it up). For most of my life I have viewed Morrison’s album Moondance as his masterpiece album and by far his best. However, on every one else’s “Greatest Albums of All Time” list, Moondance is never the first to be mentioned. Instead, it is his previous album, 1968’s Astral Weeks. Now, my dad has this one and would play it every so often when I was growing up, but I never seemed to appreciate it. I always thought that it was just a statement of the times in which it was released, and influential at best. I hadn’t heard it in years, up until last night when I decided to listen to it from beginning to end–twice. I have matured a lot, musically, since I graduated from high school. And last night I realized that this is way more than just an album that represents the times that were–it’s a piece of art that is more relevant now (I’d like to think) than it was 44 years ago. After hearing the lyrics (and reading along to them via Google searches), there is so much relatability to these songs that hadn’t ever been put down on vinyl up until that point. Yeah, yeah, I know I sound like a music snob…well, I guess I kinda am. 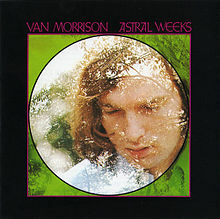 But now, in a day and age when people have trouble connecting to each other and spend most of their time indoors and can go a whole day with just the comfort of their own smart phone, Astral Weeks touches on aspects of life that go overlooked. And you know what? Even if it is just a portrait of the era it came from, it’s an optimistic look forward to whatever the days and years will present to it. And hey, not only where there NO singles released from the album, it didn’t even achieve gold status until 33 years AFTER its release. It has been compared, by several music historians, to classical music because of how it’s success goes far beyond the day and age its released in and will be studied for decades and centuries. This album may not ever be known or even acknowledged by the masses, but neither will much of Mozart’s masterpieces. I’m not even gonna give listening examples or suggested songs to listen to because all it would do is break up this very complete piece of work. It would be like framing only half of Starry Night or just showing the end of The Godfather. This is a concept album that demands your attention. It’s not just a casual listen, and it brings us back to a time where we couldn’t just press “shuffle” and go about continuing with our lives. It’s eclectic and beautiful, and he was younger than me when he wrote the majority of it. It’s not just the constant complaining and resilient “stand-taking” of Dylan. Morrison’s symbolism is not overkill, and his optimism is refreshing and contagious. But the mistake that I made was listening to this album (twice) before laying down in bed at night. My mind was racing full of ideas for new songs, and the inspiration that I received was shoving itself through my head at such a steady pace that, while I was able keep up with it all, I could neither write it all down in time, nor catch a break enough to actually keep my brain relaxed so I could sleep. Now, there’s a lot more to this album than what I can possibly fit into this blog (good thing I upgraded from Twitter), and my thoughts about it will most likely be even more profound years from now, but that’s what Astral Weeks is all about. It’s about maturity and revelation. Despite what I said earlier, we all have that instrinsic need for connectivity to each other–not to materialistic things, and Van Morrison understood that. He expresses it in so many words through his depiction of life and people and the earth’s nature. In the words of Johnny Depp, “He put on Van Morrison’s Astral Weeks. And it stirred me. I’d never heard anything like it.” (That’s an actual quote–not a line from one of his movies).